Treyarch has announced a new mode for PS4 players in Blackout, as well as a free trial of Blackout across all platforms. The Blackout free trial is now live on the PS4, Xbox One and PC and you’ll be able to earn Echelons and unlock Black Market Tiers while you play. It’ll run until January 24. 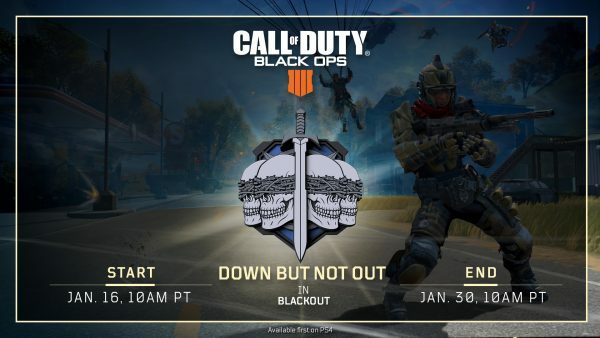 PS4 players will be able to try the new Down But Not Out limited time mode, which is available from now until January 30. Each platform will get a two week run of the new mode, so it won’t be long before Xbox One and PC players can experience it. In the Down But Not Out limited time mode, fallen teammates will redeploy with each new circle collapse as long as one player in their squad remains alive. You’ll need to make sure you can survive the circle collapse and potentially a squad of opponents, or find a convenient place to hide and wait out the return of your buddies. It would be wise to keep your eyes on the sky to incoming enemy squads parachuting down after the circle collapses, too. Those who redeploy back into the game will have a pistol, some ammo and five bandages, so you won’t be empty handing and scrambling to find a weapon when you land. Once the countdown to the final collapse begins, you won’t be able to redeploy back in. The circle will collapse more frequently in Down But Not Out, too. Depending on how you time your redeploys, we could be looking at a very frenzied final phase as full squads try to take each other out. If you’re jumping into Blackout for the first time, check out our Blackout guide for tips for beginners, the best places to land, where to find zombies and how Perks work. The post Black Ops 4: Blackout – new Down But Not Out LTM for PS4 appeared first on VG247.